This warming lemon chicken orzo soup is ready in just 25 minutes! Seeking the comforts of chicken noodle soup, but ready for a new twist? Enter this lemon chicken orzo soup! 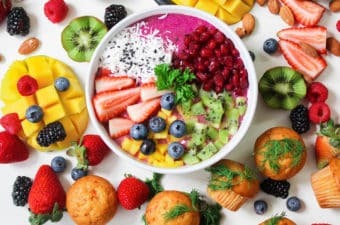 I am all about easy, delicious, and healthy recipes. I always have been. But this statement rings even more true at this very moment. Why is that? Because it has been 11.5 months since I last added a recipe to my blog. 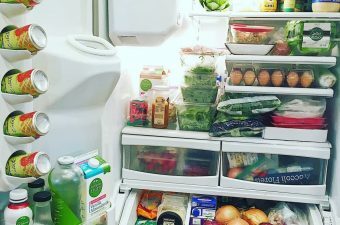 ALMOST A WHOLE ENTIRE YEAR, without posting one single new recipe. Yikes. I guess work, infertility, going through IVF, and subsequently getting pregnant all in a year will do that to ya! I am overjoyed that our IVF journey was successful. I am just weeks away from meeting our little dude. I have been nesting like crazy and ripping the house apart organizing everything. So needless to say, easy recipes that nourish my body are tantamount to my survival and sanity at the moment. I made this lemon chicken orzo soup last night and it was everything I needed- simple, minimal prep, minimal time, healthy, and YUMMY. I am happy to share this lemon orzo chicken soup recipe with all of y’all! Hopefully it becomes a staple for you when you are craving a simple, fast, yet healthy and filling weeknight dinner. It truly could not be any easier. If you don’t have any rotisserie chicken on hand, I have also provided instructions for steaming and shredding a few chicken breasts instead. This will still be a super easy recipe either way. 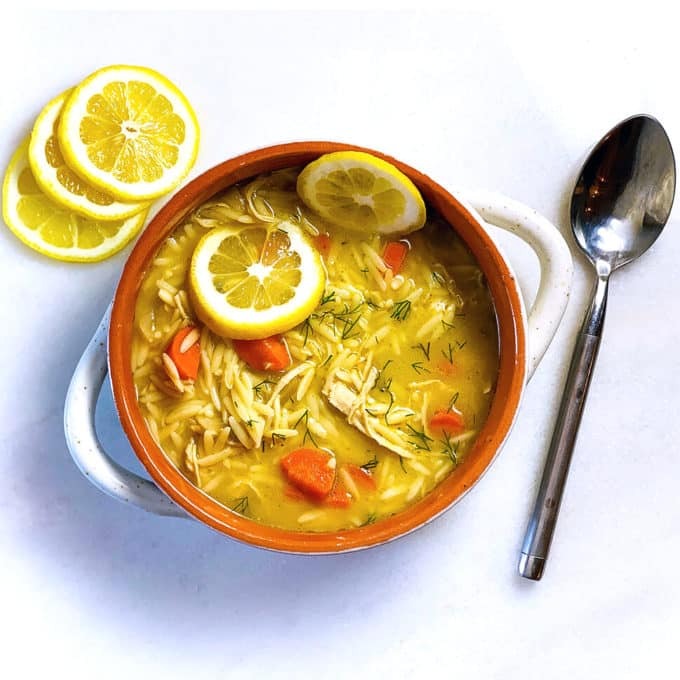 But pssst… FYI, one of my favorite kitchen hacks is buying the large rotisserie chickens from Costco, bringing it home, shredding it by hand into 2-cup portions, and freezing each portion for use in recipes JUST like this lemon chicken orzo soup. Recipe aside, it’s great to be back and working on WifeyChef! I feel like I owe everyone a life update along with this fabulous recipe. 😉 Sorry for combining the two completely unrelated things- a life update and a soup recipe all at once. Lol. I didn’t know how else to do it! I was driving today, thinking to myself how much life has changed in the past year since I last posted a recipe. And then I was thinking to myself how much life is about to change (again) in the next year, and beyond. And I knew it was time to put some habits into place and set the course of things with a new baby and with work. So I fired up my laptop and took some photos of the soup I made last night, and got cranking. When baby arrives, I will have to take a lot of time off from my normal job (working in the television/entertainment industry), so in the interim, my plan is to focus on WifeyChef, and on work that I can do from home- for myself, instead! So here I am making sure to dedicate time and energy to my blog as well! Hope to be seeing much more of y’all. I will be sure to do an update (minus recipe, LOL) when baby arrives in early May. 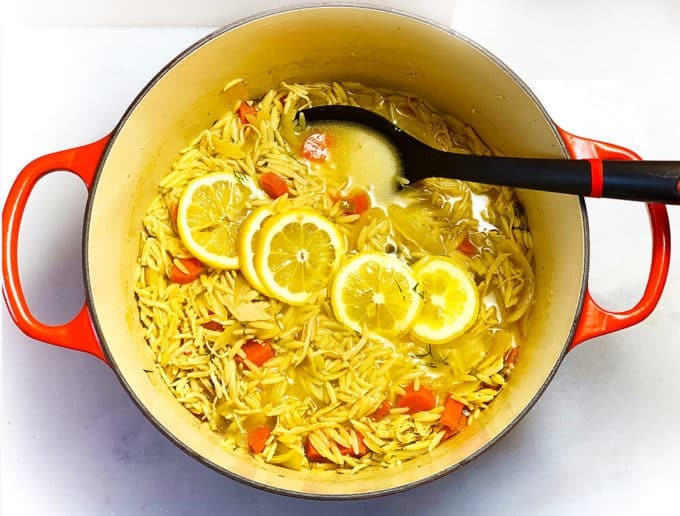 In the meantime, let me know your thoughts on this lemon chicken orzo soup, and be sure to tag me on IG, FB, or Twitter if you make this recipe! Also don’t forget to Pin this recipe! 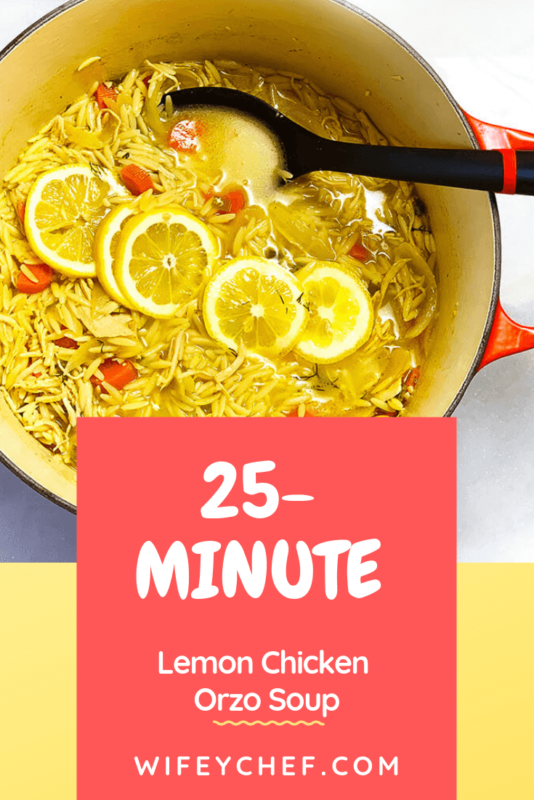 A warming lemon chicken orzo soup that is ready in just 25 minutes! All the comforts of chicken noodle soup, with a twist. Heat 1 tbsp olive oil over medium heat, using a dutch oven or large heavy pot. Add the carrots, onion, and celery (if using), plus a pinch of kosher salt and fresh ground pepper to taste. Saute, stirring often, for 8-10 minutes. Add garlic and saute for 1 minute (make sure not to burn the garlic). Add chicken broth, scraping up any browned bits on bottom of pot. Add 1 tsp poultry seasoning, as well as the cooked/shredded chicken to pot. Bring pot to a boil. Add orzo and cook 7-9 minutes, or until al dente. Remove pot from heat. Add juice of lemons, fresh dill, plus green onions and lemon slices (if using). Adjust any seasonings, including salt & pepper, to taste. Stir together and proudly serve! Don’t skip the fresh dill or lemons- both ingredients make this lemon chicken orzo soup a total souperstar! You can add more chicken broth if you would like your lemon chicken orzo soup to be runnier! You can also add some broth when reheating leftovers, as it will thicken up with time thanks to the orzo. If you don’t have shredded rotisserie chicken on hand, you can instead steam 2 medium boneless chicken breasts (or 4 small, thin boneless chicken breasts) until cooked to an internal temp of 165 degrees (about 20-25 minutes). Shred the chicken with 2 forks and viola! There’s your cooked, shredded chicken for the recipe! For even more veggies/nutrition/color, you can add some frozen spinach at the end of cooking as well. No need to thaw!